Georgia Urology, the largest urology practice in the Southeastern United States, is pleased to welcome Dr. Brent Sharpe who will be serving urology patients in our Braselton and Gainesville offices. The Braselton office will be located at 7316 Spout Springs Road, Suite 203 in Flowery Branch and will open on May 1, 2017. The Braselton office will be open Monday through Friday, 9 a.m. to 5 p.m. and can be reached at 678-205-8387. The Gainesville office (675 White Sulphur Road, Gainesville) will open in June 2017 and future hours and location information will be posted to our website. Dr. Sharpe, who has spent the past four years practicing urology in the Gainesville area, is excited to join Georgia Urology and bring his talents to the company’s newest location. “I’m looking forward to combining the resources available at the Southeast’s largest urological practice with my personalized customer service-based medicine,” Dr. Sharpe said. Specifically, Georgia Urology resources include a 24- hour kidney stone hotline, 1-855-STONE11, which allows patients to have an appointment within 24 to 48 hours of their kidney stone symptoms. Dr. Sharpe has been in private practice for 12 years. Having completed his undergraduate degree at the University of North Carolina at Charlotte, he then received his medical degree from the East Carolina University School of Medicine in Greenville, North Carolina before he completed an internship at Texas Tech Health Science Center in Lubbock, Texas. Dr. Sharpe studied alongside the late Dr. Fray Marshall during his Urology residency at Emory University in Atlanta, Georgia. Dr. Sharpe treats all urologic conditions. He has special interest and vast experience in minimally invasive surgery for a wide range of urologic conditions, such as prostate enlargement (BPH), urologic cancers, vaginal prolapse and erectile dysfunction. Additionally, he is experienced in prosthetic urology, which allows men to have a complete restoration of normal function after prostate cancer treatment. 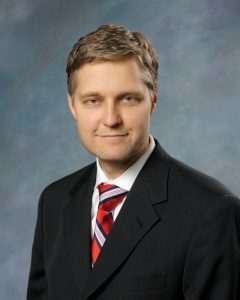 In addition to his work at Georgia Urology, Dr. Sharpe provides medical consultation and education for various organizations including Intuitive Surgical and Boston Scientific. Georgia Urology is the largest urology practice in Atlanta and throughout the Southeast. Georgia Urology has 30 locations and six ambulatory surgery centers. The practice is comprised of more than 43 physicians, many of whom are fellowship-trained and hold advanced specialty training in oncology, laparoscopy, infertility, incontinence and pediatrics. Georgia Urology physicians use state-of-the-art diagnostic equipment and advanced treatment techniques, including robot-assisted technology and minimally invasive procedures, in order to manage all urological problems in men, women and children. It is the practice’s mission to deliver the highest possible quality of care to all patients and to be the preeminent urology practice in Georgia.